How Many Games Ronaldo Will Miss - Will He Return To Old Trafford? How Many Games Ronaldo Will Miss – Will He Return To Old Trafford? Wednesday saw 5-time Ballon d’Or Winner Cristiano Ronaldo turn up for a new side in the Champions League. The Portuguese forward made his UCL debut as Juventus opened their campaign with an away fixture against Valencia. The appearance was short-lived, however, as the 33-year old was given his marching orders in the 29th minute. German referee Felix Brych took help from the linesman before ending Ronaldo’s night, as the Portuguese was seen grabbing on Jeison Murillo’s hair. The Bianconeri had a tough game after their star man left the pitch in tears, but Miralem Pjanić was clinical from the spot, which secured a victory for his side. 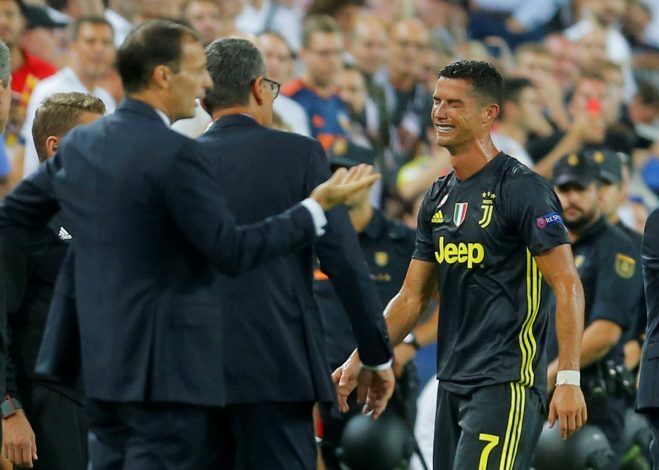 Numerous reports suggested that Ronaldo could be handed an extended ban after UEFA’s Control, Ethics and Disciplinary body meet on September 27. But ESPN sources suggest that a two- or three-match ban is very unlikely. Ronaldo will be available for the clash against his former club Manchester United. Juventus will travel to Old Trafford on October 23, with the return leg in Turin on November 7. The 33-year-old will return to his former chomping ground in Manchester for only the second since parting ways with the Red Devils back in 2009. The Portuguese superstar managed to score in both legs back when Real Madrid ended faced Sir Alex Ferguson’s Manchester United in the Scot’s final season in charge of the club. Then Madrid boss Jose Mourinho now reigns at United, and will be hoping to stop Ronaldo when they face each other. The Mancunians enjoyed a great start to their campaign on Wednesday night, as they picked up an easy 3-0 victory over Young Boys, thanks to Paul Pogba’s brace.